There aren’t many great spots for your dog to swim in any of the Finger Lakes but he will delight in frolicing in the plunge pool beneath Eagle Cliff Falls here. You have your choice of how to attack the 500-foot drop through this gorge and its three major waterfalls - if your dog prefers a more gradual ascent and doesn’t mind a straight-down descent, take the blue-blazed trail. If you favor a safer climb down with a harder hike up, stay on the white-blazed Finger Lakes Trail. The Plantations are a beguiling mix of landscaped grounds and natural areas right on campus. Situated atop Sharps Hill, the park is best known for the panoramic views from its Overlook. Spread before you are the Village of Bath, the Cohocton River and the valley beyond. Coem for the views and stay for the hiking. Unlike its gorge kin in the Finger Lake, the easy canine hike here is the Gorge Trail that travels up to the falls on a wide, flat path. The grade is so gentle that the .75-mile Gorge Trail remains open even through the winter. Traveling across these peaceful trails will transport you back more than 300 years ago when this was the main trading town of the Seneca nation before it was destroyed by the French. The star walk here is the Blue Trail that mixes open meadows with long views of the surounding hills with a woodside loop. There are no great destinations here. No great views,no sparkling waterfalls, no deep lakes. 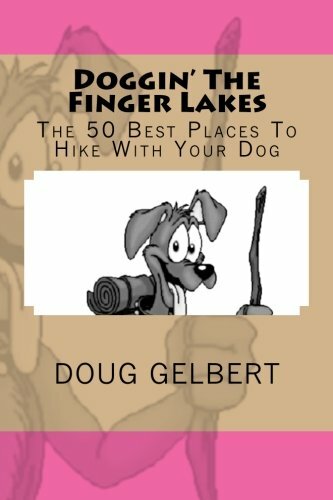 Just a great place to get out and hike with your dog. If you can’t find a suitable trail here, you aren’t trying.